I've been backpacking since I was a kid, starting in the Adirondacks of upstate New York and in nearby Quebec. I now live in California, backpacking in all four seasons there, with occasional trips back to the east coast and elsewhere. I like hiking fast, and transitioned to lightweight backpacking over the past few years. I also enjoy skiing, snowshoeing, canoeing, and aviation in addition to backpacking, so my gear gets exposed to a wide variety of uses and conditions. As a design and usability expert, I love analyzing and improving products; backpacking provides a rich arena for that. The poncho is cut on an unusual diagonal pattern, and the hood - which has a drawstring with cordlock - is located dead center. Hook and loop fastener strips along both sides of the poncho allow them to be sealed up as partial sleeves, and there are finger holes in the ends of the diagonals at each arm. There are nine webbing loops around the poncho - eight around the sides, and one in the center of the diagonal behind the hood. The poncho appears well made and arrived carefully seam sealed. Though I did not receive instructions with my Poncho Villa, I subsequently was forwarded an electronic version from another tester, and AntiGravityGear will now ship instructions with all Poncho Villas. 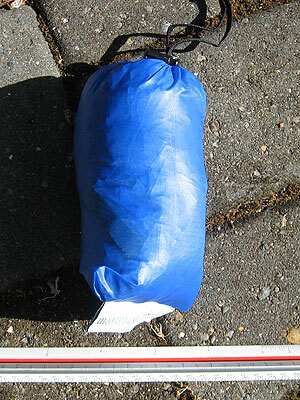 The instructions cover basic use of the finger holes and stuff sack, and illustrate in words and pictures how to attach the Poncho Villa to the AntiGravityGear TarpTent. The AntiGravityGear web site is excellent, providing thorough details on this product and the related TarpTent. I tried out the Poncho Villa the day I received it; it was a sunny day, so I didn't get to test the poncho's weather resistance, but I did get a good sense of its fit and usability. The hood is easy to adjust and snug up, and is roomy - I found it easy to turn my head when wearing it. I found it reasonably easy to set up the partial sleeves with the hook and loop fastener strips along the poncho's edges, and discovered that the finger loops are quite large, accommodating several of my fingers. One minor issue that struck me on first wearing: the front point of the poncho hangs down quite far, and I wonder whether the design might be better served by moving the hood forward a bit, such that more fabric drapes over one's back. This would be especially useful while wearing a pack, possibly providing greater coverage for the pack while reducing the amount of fabric dangling in front. I'll keep an eye on this as I get the poncho out in the field. I also tested the Poncho VIlla as a vestibule for the AntiGravityGear TarpTent I'm testing - while you can reference that report for futher details and pictures, I'll say that it's a clever and easy-to-use feature. I'll be taking the Poncho Villa out into the field on numerous trips in the coming months, from the Lost Coast of California to the Sierra Nevada, as well as a trip or two to the Cascades and Adirondacks. I will do my best to expose it to rain and inclement weather, as well as to use it as a vestibule for the AntiGravityGear TarpTent. I'll be examining effectiveness, usability, durability and comfort, and will take pictures to document my experiences. The AntiGravityGear Poncho Villa is an unusual diagonal-design poncho that also serves as an emergency mini-tarp and a vestibule for the company's TarpTents. On first look I find that it's well made, compact and light in weight; I look forward to seeing how well it performs in the coming months. I've been on two trips in the past two months with the Poncho Villa. Locations were in Marin and Sonoma counties in Northern California, with elevations from sea level to 2500 ft (760 m). Temperatures ranged from 55-85 F (13-30 C), and weather was sunny with nothing more than light winds on both occasions. We've had no precipitation whatsoever throughout this period. I also tried the poncho on at home with a couple of different packs to assess fit and coverage. I've used the Poncho Villa for two purposes: as prospective rain gear, and as a vestibule for the Antigravitygear Tarptent I'm also testing. My Tarptent report provides details on the latter usage, which is a particularly nice feature of both the Poncho Villa and the Antigravitygear Tarptent; this report focuses on the Poncho Villa as an article of clothing. Since the weather for the past two months has been completely dry and mild, I can only comment in general on the fit and feel of the poncho, and how well it provides coverage for my packs. I pulled the poncho on over the top of a fully-packed 66 L (4000 cu in) pack and found that it does indeed ride a bit short in back with a pack of that size. I'm concerned that the sides and base of the pack would get wet if I were in any sort of precipitation, and hope that I run across a real storm in my long-term testing so I can confirm or dismiss that concern. The poncho provides better coverage for the two smaller packs I used it with - a 49 L (3000 cu in) ultralight pack I use for trips up to five days in length, and a 20 L (1200 cu in) day pack. I walked for a little while on a coastal trail wearing the poncho over the day pack, even though the weather didn't call for it. 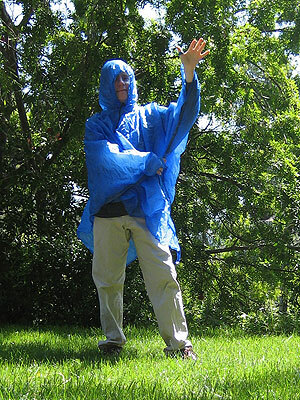 I found the poncho comfortable for wearing on the move, the hood roomy (with a slight tendency to slip down over my brow), and the thumb loops and "sleeves" to work fine while walking with poles. Actual evaluation of coverage and gaps therein will have to await a rainstorm. The poncho remains in pristine condition - no wear and tear, and no durability problems (no surprise given the limited exposure, but wanted to keep the baseline current for my long-term report). The Poncho Villa is a diagonally-arranged square poncho with tie-out loops for use as a small tarp or a Tarptent vestibule. I like the design, but have slight concerns about pack coverage, which I hope I'll be able to answer by coming across precipitation in my long-term testing. I'll continue to test the points noted in my initial report, with a special focus on seeking out stormy weather. My best bet is afternoon rainstorms in the Sierra Nevada, where I have a couple of trips planned in the coming weeks. In addition to seeking out bad weather, I'll pitch the Poncho Villa as a tarp at least once, and continue to use it as a vestibule for the Antigravitygear Tarptent. During the last two months of testing I used the Poncho VIlla on several hikes in the Adirondacks and in Marin County, California. Hiking elevations ranged from 700' (210 m) to 5,300' (1,610 m), and conditions from mostly dry and sunny to (on one lucky occasion) wet and rainy. Alas, I've only had occasion to use the poncho once for its main intended purpose as personal rain gear, and that was on a damp but not particularly rainy day in the High Peaks region of the Adirondacks. It had rained hard the night before, so brush was still quite damp, and the trail muddy and wet. There were light sprinkles on and off during the day, and I wore the poncho a couple of times when it sprinkled. In addition, I've tried on the poncho a couple of times over various packs at home, and while day hiking out and about in Marin County, just to get a sense of how it felt with different gear setups. Things I like: the "sleeves" created by hook and loop fastener strips along opposite sides of the left and right corners of the poncho; the hand/thumb loops (though those might be better made smaller as thumb loops, or larger as hand loops - the ones on my poncho are a bit too large for the former, a very tight fit for the latter. Overall, it's easy to move fast while wearing the poncho, and I had no trouble using it with trekking poles due to the loops and sealable sleeves. Regarding coverage: worn over any of my day packs, the Poncho Villa is a fine fit. However, when I wear a larger pack such as the Osprey Exposure 66 I used on the Adirondack backpacking trip, I find that the poncho is a bit short in back, since it has to also fit over the pack. I'd suggested in an eariler report that the Poncho Villa might benefit from its hood being moved forward a bit toward one of the corners, rather than being smack dab in the middle, and my experiences in the field support that. With its current design, the poncho's front corner hangs down fairly close to my feet, while the back (and especially the open sides) leave a fair amount of my pack and the back half of my legs and rear completely exposed. The hood itself also isn't the best match with my build - I would prefer a longer neck, which would move the opening up a bit. I had decent head mobility with the cord cinched down, but the opening tended to shift forward and down. That's not inconvenient for hiking while looking down at the trail, but is more so for looking further out in the distance. So: bottom line, I think the design of the Poncho Villa could be improved to offer better coverage. However, since I've never had the chance to experience driving rain while wearing it, I can't say if this is a real issue that would leave me soaked, or just a preference. I'll be sure to post an update if I do happen to finally get into some real rain. The other purpose for the Poncho Villa is as a vestibule for the Antigravitygear Tarptent, and I've used mine several times in that role, including in some quite significant driving rain. You can see full details in my report on the Tarptent, which I've also been testing, but I'll repeat some of the details here. 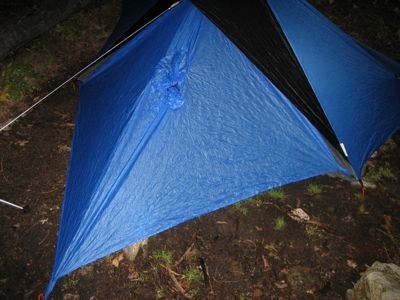 The poncho has an extra loop along one diagonal centerline that is meant to hook into the peak cup on the Tarptent; two opposing corners of the poncho connect to mitten hook fasteners at the bottom front corners of the tarptent, and the final corner can be staked out underneath the main line of the tarptent (see picture below). Once I've tightened up the hood as much as possible, I'm left with a quite decent and weather-worthy vestibule. I found it easy to pop the poncho's corner loop out of one of the mitten hooks to fold it back for ingress or egress, and the poncho provides fine coverage and a vestibule large enough for careful cooking or storage of boots or a smaller pack. As noted elsewhere, I have found it easier to hook the loop on the poncho to a mitten hook and cord at the apex of the tarptent's beak, rather than trying to wedge it in under the pole after the tarptent is set up. This provides a bit more ventilation but also makes it possible to add and remove the poncho with ease at any time (e.g. to go for a walk in the rain while leaving the tarptent set up). The Poncho Villa packs into its own sewn-in pocket, which is a great idea; no problems there, and other than the aforementioned cord, the materials and stitching on the poncho have held up well. I did not seam seal the poncho, but never experienced any noticeable leakage through seams, even after the driving rain I experienced while using the poncho as a vestibule. In general, I appreciate some of the features of the Poncho Villa when used as a poncho, but think it could be made even better by a few design tweaks to the hood, its position (and the resulting pack coverage), and the thumb loops. That said, I never came across strong rain in my testing, so I will post back with updates if I finally get it out in more ferocious weather this winter. In its role as a tarptent vestibule, the Poncho Villa does a fine job - I like it quite a bit, and my only real complaints are with how the tarptent interfaces with the poncho (detailed in my tarptent report). While I would be cautious about recommending the Poncho Villa as a standalone poncho, I definitely recommend it as a part of the Antigravitygear tarptent system.